The journey of faith is at the heart of why we are in this earthly life. Our God has issued an invitation to us… He has called us to a life of holiness and a communion of love with Him in this life and the life to come. He has called us to faith. So often in this life, we lose sight of this important truth and gift. The demands of our daily living distract us from our true purpose and we find that our spiritual growth stagnates. We tend to compartmentalize our lives. The practice of faith is restricted to our time at church. Our family time is focused on earthly concerns of raising children and tending to spouses according to the expectations of the secular world. Work and career seem to override other considerations as we seek economic survival and professional success. The role of faith beyond the walls of the church is sometimes restricted to occasional prayers before meals, turning the religious education of our children over to others and the occasional pangs of guilt that arise when we discover that our decisions in all areas seldom consider the will of God. For many of us, we recognize this deficiency and disconnect between the life of faith to which God has called us and the lives we lead. We may even try to correct this, but are we making progress? We are in the midst of a Year of Faith, announced by Pope Benedict XVI, that began on October 11, 2012 – the Fiftieth Anniversary of the opening of the Second Vatican Council. This is a great gift for us; a time to rededicate ourselves to the journey of faith and a deepening of our life of prayer and a renewal of the Gospel of Jesus Christ in our lives. A quick search on the internet and your parish book racks will provide you with many tools and resources to aid you in this effort. 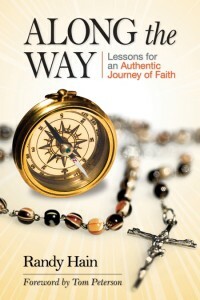 But, I encourage you to obtain a copy of Randy Hain’s new book, Along the Way – Lessons for an Authentic Journey of Faith, Liguori Publications, 2012. In this book, you will find practical guidance for allowing the ordinary challenges of daily living to become moments of grace and spiritual growth.